Previously sold at Sotheby's Hong Kong, 21 May 1979, lot 105. The extraordinary effect of this glaze is achieved by applying an opaque stippled turquoise glaze coloured with copper and made opaque by mixing the arsenic as an opacifier. Rose Kerr noted in Chinese Ceramics, Porcelain of the Qing dynasty, London, 1986, p. 88, that while visual examination reveals there to be two distinctive types of robin's-egg glaze, one streaked with copper-red and the other stippled with blotches of turquoise and dark blue, further analysis is required to clarify the chemistry of these glazes. The peacock-feather glaze appears to be closely related to the more common robin's-egg glaze, but the former is much rarer, possibly due to the difficulty in successfully achieving its desired effect. 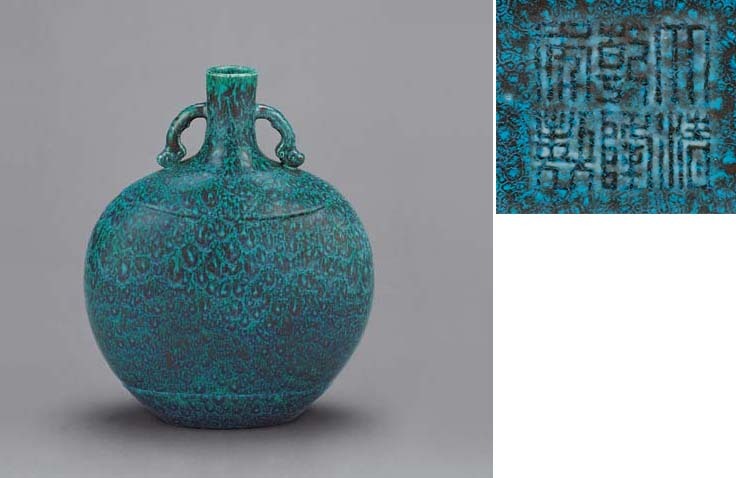 A near identical, although slightly larger, Qianlong-marked moonflask covered in a robin's-egg glaze was sold at Sotheby's Hong Kong, 29 October 1991, lot 85; subsequently sold in these Rooms, The Imperial Sale, 29 April 1999, lot 543, and again, The Imperial Sale, 7 July 2003 (Catalogue dated 28 April 2003), lot 582. This appears to be the only other moonflask of this type. A peacock-feather-glazed jar, zun, formerly in the J. M. Hu Collection, was included in the Min Chiu Society Silver Jubilee Exhibition, Anthology of Chinese Art, Hong Kong Museum of Art, 1985, and illustrated in the Catalogue, no. 184; while a compressed jar with a similar type of glaze, from the Palace Museum, Beijing, is illustrated in Kangxi Yongzheng Qianlong, Hong Kong, p. 457, no. 139.